Sadie is a young lady of mystery ~ her past is unknown as well as her breed makeup. One thing is certain, this charming little girl is happy to be alive and will shower you with kisses! Sadie “may” have some Siberian in her ~ if you squint ~ but we could not say “no” to such a wonderful dog. 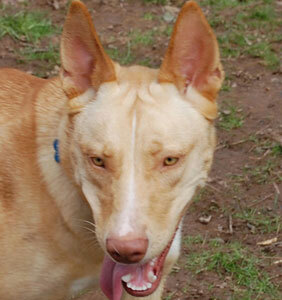 She did have us stumped however, and research leads us to believe that she is an Ibizan Hound mix. We checked with those folks and they have agreed they see their breed in her. It is curious, yet doesn’t matter; Sadie is a good dog that has captured our hearts. Sadie is good with other dogs and loves people. It is our initial opinion that she would be best in a home with no kids under ten. She can be a little reserved with strangers, but quickly warms up. We suspect she may have had a hard life prior to coming into rescue and possibly suffered some abuse. We are enjoying getting to know Sadie and she is blossoming with TLC. Please feel free to contact us to learn more about this sweetheart.